At Anderson Cleaners, we professionally hand clean and treat every gown with a unique anti-sugar process to remove latent stains that turn brown over time. We preserve your gown in acid free paper and use our special bridal box to ensure your gown will be available for future generations. With Anderson Cleaners, you are assured that your wedding gown and accessories will be treated with the utmost care and consideration. We use the safest, most effective methods available to restore and preserve your wedding gown, and we also provide the individual care and attention your gown deserves. 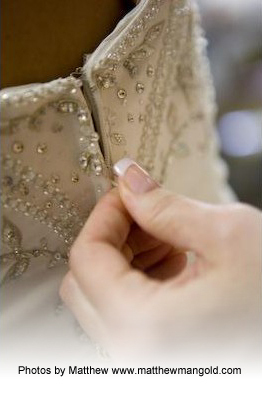 For over 95 years, we have taken pride in providing a superb wedding gown service to our customers. Use a special gown box that helps prevent contamination. Store your gown in a cool, dry place. Do not store it in the attic or basement. Never store your gown in a plastic bag. Plastic holds in the moisture and may cause your gown to mildew. Inspect your gown from time to time during storage. Stains, not initially apparent, could appear later, and should be tended to immediately. We will be pleased to give you a free consultation, inspection, and estimate for the care and cleaning of your gown. After the cleaning process, we suggest that you arrange to inspect your gown before the preservation process to make sure it meets with your approval. Your wedding gown is one of your most precious possessions. It is a symbol of an important event in your life and should be treated with special care. Anderson Cleaners will treat that special possession with the special care it needs. To arrange for a personal consultation and examination of your wedding gown, call (716) 664-5610.